Alberta Heartland Chorus is proud to announce Nancy Tiedeman and Dineke Philipsen have completed their DCP (Director Certification Program). They are now recognized by Sweet Adelines International as Certified Directors. Completing the DCP program is a huge accomplishment. It is a series of modules covering everything from choosing music to analytical listening skills and planning a rehearsal. Dineke first signed up for the program in July of 2003, when she was the interim director of Hearts of Harmony Chorus in Red Deer. 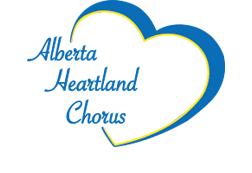 Life soon led her in another direction and she became a member of Alberta Heartland Chorus in 2004. However, she continued with the modules and wrote her first exam in San Antonio in 2005. After a break of a few years, Dineke set herself the goal of finishing the program by April 2016. With the help of Director Lisa Hunszinger and DCP coordinator Lynda Elliott, she was able to meet that goal. Dineke wishes to thank everybody who helped her along on this journey, notably Lisa and Lynda, but also Alberta Heartland Chorus members for allowing her the freedom to "stumble in front of them". And to everyone who filled in the evaluations along the way. Nancy also began the program and then had to set it aside for a few years. At the time she was singing with two choruses (Lionsgate and Alberta Heartland) and on the music team of Alberta Heartland. She soon took on the job of Team Leader , but decided to get back to working on the modules at the same time. In March of 2016, Nancy received notification that she had passed the final module and was a Certified Director. It was a thrill to see Dineke and Nancy invited to direct at our recent regional convention. Congratulations, Ladies. You are certainly an inspiration with your perserverence, work ethic and musical talent.